Sleeps 6 (3 Bedrooms)Bedroom 1 with double/twin beds. Bedroom 2 with double bed. Bedroom 3 with double bed.En-suite bathroom to bedroom 1 with shower, sink and wc. En-suite bathroom to bedroom 2 with shower, sink and wc. En-suite bathroom to bedroom 3 with shower, sink and wc.The kitchen is fully equipped with all modern appliances, including fridge/freezer, microwave, hob and oven.The main living area has an open plan design with the kitchen, dining room and living room flowing into one elegant space, all leading out through French doors to the balcony, garden and pool. Cable TV/DVD. Wifi & MP3 Docking. Linen, bath towels and beach towels are provided. Laundry is available at extra cost. Octopus Villas benefit from their own private pools and gym. Also a private yacht is available to charter. Take a day or overnight charter to the other beautiful Grenadine islands or cays, or enjoy a relaxing sunset cruise around the bay. Octopus Villas are located just two minutes drive from the closest beach and five minutes drive to the main town of Port Elizabeth. Quiet and peaceful, the villas have easy access to all amenities, with plenty in the surrounding area to see and do during your stay, including the local markets for bargain hunting, the beautiful white sand beaches and many excellent restaurants and bars for eating out. I am originally from England but have lived and worked all over the world including Australia, New Zealand, Asia, Europe and the Caribbean. When I was younger I worked on Cruise Liners as a Croupier and discovered a passion for scuba diving whilst in Mexico and decided that a life on or in the sea was for me. I became a P.A.D.I Divemaster, also a RYA Windsurfing, Dingy Sailing and Kayak Instructor and worked around the world in beach resorts and on motor and sailing yachts. I am now a skipper (Yachtmaster Offshore-Commercially Endorsed) and Cruising Instructor on my own yacht in Bequia and villa owner. Both can be taken individually or combined to provide a fabulous holiday in the Caribbean. I love the island of Bequia because it is the 'real' unspoilt Caribbean. There are no fast food restaurants, no big hotel complexes. It is just very local, very friendly and very beautiful. The people of Bequia are lovely, very smiley and I have made some very good friends here and it is lovely to feel part of the island and the community. For a small island, there is a huge variety of bars and restaurants, with delicious local and international food and drinks. The views are stunning and the beaches are never crowded, but always gorgeous - white sand and clear blue sea. Everyone who comes to this island falls in love with it - I honestly haven't met anyone who hasn't. Octopus Villa Two is equipped with everything you could need. From the pool and gym to your own private yacht (additional cost), Octopus Villa Two really does provide everything. Notes on accommodation: The main living area has an open plan design with the kitchen, dining room and living room flowing into one elegant space. From the lounge and dining area there is direct access to the main veranda, terrace and pool area through sets of French doors making the whole area beautifully light and open with stunning views of the whole bay. Three double bedrooms each with French doors leading directly to balcony and pool. Each bedroom is comfortable and tastefully appointed. Air-conditioning in bedrooms.Ceiling fans in all rooms. Large flat screen cable TV/DVD in lounge. Docking station (MP3). Wireless internet. Solar hot water. Outside: The outside areas consist of verandas, terrace, tropical gardens, pools, bbq's ,seating and dining area. If you are feeling energetic spend some time in the air-conditioned gymnasium. Exterior facilities include: Pool. Private gymnasium (A/C & fans). Outdoor dining areas. Private gardens. BBQ (gas). Sea facing verandas. Sun loungers. Outside shower (Unit 1). The nearest beach is Princess Margaret, a lovely golden sand beach, which is a 10 minute walk/2 minute drive away. There are many beautiful beaches on Bequia including the beautiful palm fringed Lower Bay, the stunning, long wide Friendship Bay, the remote beauty of Hope Bay among many others perfect for snorkelling, soaking up the rays, sipping on cocktails or enjoying a long leisurely lunch. Nearest port - Port Elizabeth 0.8 km. Octopus Villas are located just two minutes drive from the closest beach and five minutes drive to the main town of Port Elizabeth. Quiet and peaceful, the villas have easy access to all amenities, with plenty in the surrounding area to see and do during your stay, including the local markets for bargain hunting, the beautiful white sand beaches and many excellent restaurants and bars for eating out. 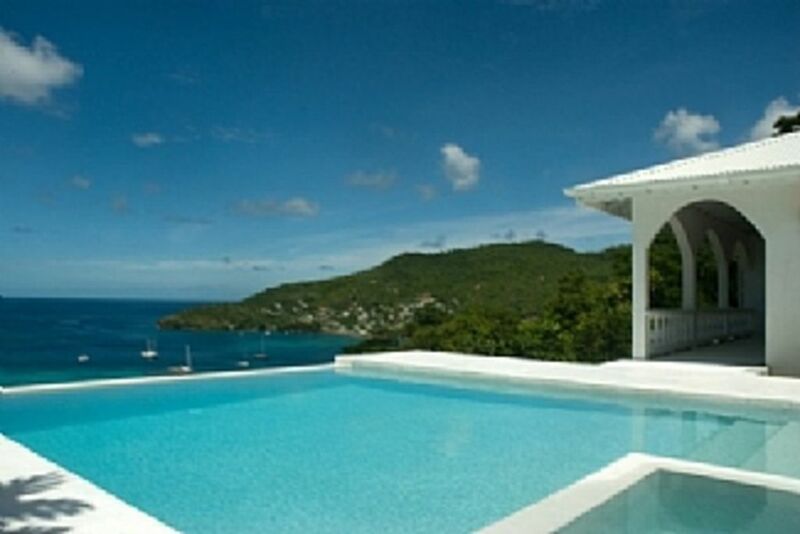 Bequia is not just another Caribbean holiday destination. It is a "big little island" with a proud sea-faring history, active community life and a friendly, independent minded people. Visitors come back time and time again for more of the special Bequia magic. Bequia offers a wide range of activities, from sailing, scuba diving and snorkelling to sports fishing and day/overnight charters to other islands and cays. Or you can just laze on one of the many beautiful beaches, swimming and snorkelling the unspoilt reefs. There are walking and hiking trails for flora and fauna lovers and for those interested in historic sites, magnificent views of Mustique and the Southern Grenadines can be seen from the mountain tops. Visit the model boat building shops, a trade left over from the days of the great schooner builders and the Old Hegg Turtle Sanctuary, where Brother King rears and releases hawksbill turtles. Booking Notes: Changeover Day: Changeover day is flexible. Arrival and departure times are flexible.